Postural drainage is of vital importance and patients must be trained by physiotherapists to tip themselves into appropriate positions at least three times daily for 10- 20 min. Most patients find that lying over the side of the bed with head and thorax down is the most effective position. Experience from the treatment of cystic fibrosis suggests that bronchopulmonary infections should be eradicated if progression of the disease is to be halted. In mild cases, intermittent chemotherapy with cefaclor 500 mg three times daily or ciprofloxacin 500 mg twice daily may be the only therapy needed. Flucloxacillin 500 mg 6-hourly is the best treatment if Staph. aureus is isolated. is a useful drug in persistent infection. 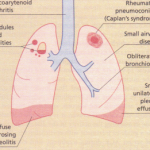 If the sputum remains yellow or green despite regular physiotherapy and intermittent chemotherapy, or if lung function deteriorates despite treatment with bronchodilators, it is likely that there is infection with Ps. aeruginosa. Treatment requires parenteral or aerosol chemotherapy at regular 3-monthly intervals. 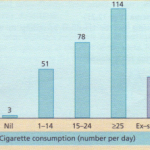 Ceftazidime 2 g intravenously 8-hourly or by inhalation (I g twice daily) has been shown to be effective. Ciprofloxacin 500 mg twice daily orally is equally effective. These drugs are replacing older drug regimens involving tobramycin or gentamicin together with tircarcillin or azlocillin. High sputum levels of some antibiotics can be achieved by inhalation. A treatment regimen of carbenicillin 1 g and gentamicin 80 mg given by a compressor-driven nebulizer twice daily was found to be of benefit in young adult patients with chronic Pseudomonas infection but many physicians prefer intravenous therapy with ceftazidirne. Bronchodilators Bronchodilators are useful in patients with demonstrable airflow limitation. Unfortunately, bronchiectasis is rarely sufficiently localized for surgery to be of any value. The incidence of complications has fallen with antibiotic therapy. Pneumonia, pneumothorax, empyema and metastatic cerebral abscess can occur. Severe, life-threatening haemoptysis can also occur, particularly in patients with cystic fibrosis. MASSIVE HAEMOPTYSIS ongmates from the high pressure systemic bronchial arteries and has a mortality of 25%. Other causes include pulmonary tuberculosis, aspergilloma, lung abscess and infection, and primary and secondary malignant tumours. Bed rest and antibiotic treatment is essential together with blood transfusion if required. Urgent fibreoptic bronchoscopy is necessary to detect the source of bleeding. If the haemoptysis does not settle rapidly the affected area must be surgically resected. Bronchial artery embolization is the treatment of choice in those not fit for surgery. Cystic fibrosis (CF) is due to an alteration in the viscosity and tenacity of mucus production at epithelial surfaces. The classical form of the syndrome includes bronchopulmonary infection and pancreatic insufficiency, with a high sweat sodium and chloride concentration. It is an autosomally recessive inherited disorder with a carrier frequency in Caucasians of 1 in 22. There is a gene mutation on the long arm of chromosome 7 (7q 21.3 -+ 7q 22.1). A specific deletion in the coding region (the codon for phenylalanine at position 508 in the amino acid sequence [dFsos]) has been found resulting in a defect in a transmembrane regulator protein now called the cystic fibrosis transmembrane conductance regulator (CFTR) which probably represents a critical chloride channel. The mutation alters the secondary and tertiary structure of the protein leading to a failure of opening of the chloride channel in response to elevated cyclic AMP in epithelial cells. 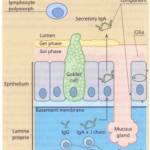 This results in a decreased excretion of chloride into the airway lumen and a threefold increase in the reabsorption of sodium into the epithelial cells. With less excretion of salt there is less excretion of water and increased viscosity and tenacity of airway secretions. A possible reason for the high salt content of sweat is that there is a CFTR-independent mechanism of chlo ride secretion in the sweat gland with an impaired reabsorption of sodium chlo ride in the distal end of the duct. The frequency of dFsos mutation in CF is 70% in the USA and UK, <50% in southern Europe and 30% in Ashkenazic families. The identification of this transmembrane regulator protein will allow more accurate detection of carriers of the mutant gene. Although the lungs of babies born with CF are structurally normal at birth, respiratory symptoms are usually the presenting feature. CF is now the commonest cause of recurrent bronchopulmonary infection in childhood, and is an important cause in early adult life. Finger clubbing is almost universal, haemoptysis is frequent and breathlessness occurs in the later stages as airflow limitation develops. Older children may also develop nasal polyps. Puberty and skeletal maturity are delayed in most patients with the disease. Males are almost always infertile owing to failure of development of the vas deferens and epididymis. Females are able to conceive, but often develop secondary amenorrhoea as the disease progresses. About 85% of patients have symptomatic steatorrhoea owing to pancreatic dysfunction. Children may be born with meconium ileus due to the viscoid consistency of meconium in CF and later in life develop the meconium ileus equivalent (MIE) syndrome, an important cause of small intestinal obstruction unique to CF. 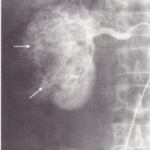 Cholesterol gallstones appear to occur with increased frequency and cirrhosis develops in about 5% of older patients. • A family history of the disease. • Absent vas deferens and epididymis. 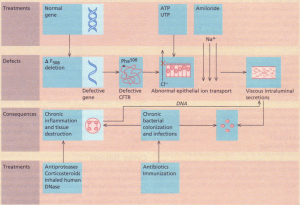 Antibiotic treatment for the respiratory disease is described under bronchiectasis on p. 665 and treatment of pancreatic insufficiency is described. The understanding of the basic abnormality in CF has led to dramatic changes in treatment-potential treatments to improve hydration of secretions include blocking of Na” reabsorption with amiloride or stimulating Cl- secretion with a triphosphate nucleotide (adenosine or uridine triphospates. ATP and UTP) which stimulate nucleotide receptors by a pathway independent of cAMP. Viscosity of secretions is contributed to by macromolecules such as DNA from dead inflammatory cells. Human DNase capable of degrading DNA has been cloned, sequenced and expressed by recombinant techniques. Inhalation of this material has been shown to improve FEV] by 20%. Similarly, inhaled or oral corticosteroids and antiproteases such as inhaled (X] -antitrypsin help to reduce inflammation and improve lung function. So far tested only in experimental animals is the delivery to the epithelium of the normal CFTR gene using as a vector a replication-deficient adenovirus containing normal human CFTR complementary DNA which is trophic for epithelial cells. Successful trials in CF patients would herald a new era of treatment. Since donor material is limited, single lung transplantation is preferred to double lung or heart-lung transplantation and can be successfully undertaken in pulmonary fibrosis, pulmonary hypertension and emphysema. Bilateral lung transplantation is required in infective conditions to prevent spill-over of bacteria from the diseased lung to a single lung transplant. Eisenmenger’s syndrome requires heart-lung transplant. 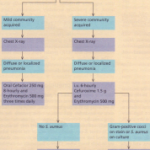 (b) Late-3 months: in obliterative bronchiolitis highdose i.v. corticosteroids are sometimes effective Prognosis is improving rapidly with 2-year survival of 75% and 5-year survival of almost 50%. Appropriate treatment for any of the conditions discovered can relieve symptoms. In the absence of any pathology management of cough is difficult. Morphine treatment will depress the sensitized cough reflex but its unwanted effects limit its use long term. 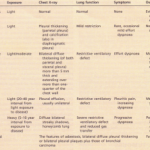 Nebulized bupivocaine is of value. Demulcent preparations and cough sweets provide temporary relief only.